Stephon Marbury ha decidido hacerse un nuevo tatuaje para olvidar las penas o quizás para explorar las posibilidades de convertirse en hombre anuncio. Stephon Marbury bounded off the Knicks New York Knicks team bus at Vegas' Valley High last night - a new tattoo inscribed on his left temple. 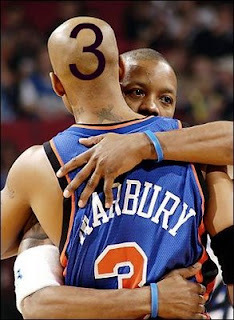 The "3" logo found on his Starbury sneaker and apparel line is now a permanent part of his bald head. "I love New York, I want to play in New York," Marbury said. "But I understand the direction they would be going in if that was to happen. "I'm supposedly old. But there are 29 other teams. I love New York. I want to finish my career here. I feel I have a lot more to give. But I guess I have to prove that because I haven't been on the court much. You guys are saying I can't play anymore. It's kind of fun. It's a challenge." ¿En qué franquicia podría encajar?